There is incredible speculation as to the origins of the McEwan and its clan. One can read many theories and by the end be no farther ahead a discovering the truth. Some believe the McEwan name (Gaelic MacEoghainn or son of Ewan) were a broken clan, orally they were descended from Dal Riadic Irish that settled in Cowal and Knapdale in Arygll on the West coast of Scotland around 1000 AD. The current name is a transliteration from the original Gaelic. In our known family history of the last 200 years the name has been spelt as McEwing, McEwen and McEwan, McKeon, MacEuen, MacKewin, MacKewan, McCuen MacEòghainn (Gaelic) and so on. Eoin or Owen are Gaelic forms of the name John (also a Hebrew form of Yochanan meaning Jehovah has favoured me with a son). The family was granted a Coat of Arms in 1796. It must be noted that surnames only became necessary when England introduced the Poll Tax. Another theory I read while reading a Scottish discussion forum I learned that the McEwans trace their descentdents from the Kings of Ireland and claim a common ancestor, Anradan, along with the Lamonts, MacLachlans and the MacNeils. Together these clans were in possession of the greater part of the district of Cowal. ​ The MacEwens were established on a strip of land along Loch Fyne at Otter, on the eastern shore Loch Fyne, in the parish of Kilfinan, where as late as 1750, there existed the ruins of 'Caisteal mhic Eoghain' (MacEwan's Castle). According to this theory after the death of Swene in 1513,the lands of Loch Fyne remained in the possession of the Campbells and the MacEwens became a "problem" clan. Some remained there but others dispersed to many districts, particularly Lennox and Gallowy. Some became absorbed by the Camerons and Mackintoshes others stayed on in Argyll and associated with the Campbells and the MacDougalls. Many of the clan settled on the shores of Loch Lomond in the Lennox country and are claimed to have fought on the side of Mary Queen of Scots at the battle of Langside in 1568. Some moved on into Galloway and others to Perthshire. However despite the fragmented nature of the clan, the ruins of MacEwen's castle can still be seen on the coast of Loch Fyne, and as a commemorate mark, the MacEwen Clan Society erected a cairn at this spot in 1990. ​ More recently it is thought that the MacEwens of Otter lost their land to the Campbells in 1463 AD. Becoming a “broken clan” they dispersed and gained safety among various other clans, these being the Campbells (Argyll), Stewarts (Loch Lomond) and their relatives the Lamonts and the MacLachlans. ​ There are others further south in Galloway, north in Lochaber and west inPerthshire. ​​​​ It is believed that my line of early McEwans originated in Paisley Renfrewshire, Scotland. The line did however migrate to Ireland for a time. One wonders why, but the history explains what most probably happened. ​​ The original pretext or opportunity for the planting of a Protestant colony in Ireland came in September 1607, when the Roman Catholic Earls of Tyrone and Tyrconnell, in fear of King James, fled the country and took refuge in Catholic France. This event, known in Irish history as the "Flight of the Earls," resulted in the lands of these noblemen being forfeited to the English Crown. 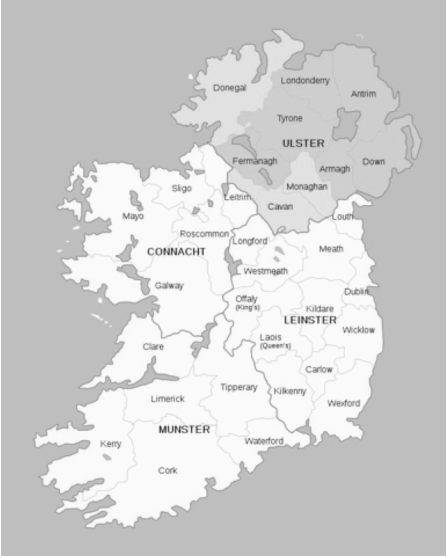 These "escheated" lands amounted to approximately six of the nine counties of Ulster, i. e., the counties of Antrim, Down, Fermanagh, Tyrone, Coleraine (later renamed Londonderry) and Donegal. This time period, however was well before my McEwans emigrated to Northern Ireland. ​​​ The Scotch-Irish were Lowlanders which had a great bearing on how it influenced their position in Ireland. The Plantation of Ulster proved to be successful economically encompassing the six counties in Northern Ireland of Donegal, Coleraine, Tyrone, Fermanagh, Cavan and Armagh. ​​​ Ireland had been an extremely poor country. To quote James G. Leyburn " … most of Ireland, whose peasants spoke no English and lived a wretchedly poor agricultural life under their chieftains. Their culture, like their background and poverty, made them resemble the Highlanders of Scotland, and civilized Englishmen regarded them, as they did the Highlanders, as little better than savages." ​​​​​​ Finally, another major influx of Scots into northern Ireland occurred in the late 1690s, when tens of thousands of people fled a famine in Scotland to come to Ulster. It was only after the 1690s that Scottish settlers and their descendants, the majority of whom were Presbyterian, gained numeric superiority in Ulster. Along with Catholic Irish, they were legally disadvantaged by the Penal Laws, which gave full rights only to members of the state church (the Church of Ireland), who were mainly Anglo-Irish and converts or the descendants of English settlers. For this reason, up until the 19th century, there was considerable disharmony between Dissenters and the ruling Protestant Ascendancy in Ireland. With the enforcement of Queen Anne's 1703 Test Act, which caused further discrimination against all who did not participate in the established church, considerable numbers of Ulster-Scots migrated to the colonies in British America throughout the 18th century. Whatever their motives my line of McEwans eventually returned to Scotland before immigrating to Canada. The industrialisation of the city of Glasgow must have lured them back to their homeland but also caused them more hardship and pain. All this is explained in my blog about Glasgow at the time my ancestors returned.